Writing after more than a week. I was travelling. Anyway, I am planning to start a fun new series of posts, which you understand by the title. I will cover various fun things you can do with Wolfram|Alpha, when you're feeling bored. If you don't know what this Wolfram|Alpha thingy exactly is, you live under a rock! It's a still-under-development-but-pretty-powerful online computational engine. It is not to be confused with a search engine. What it's supposed to do is to interpret our language and understand questions. Then it has to get data from various sources and answer it. It has some great fun stuff and useful tools built into it. You can also use it to pass your time, if you want. There's no harm. 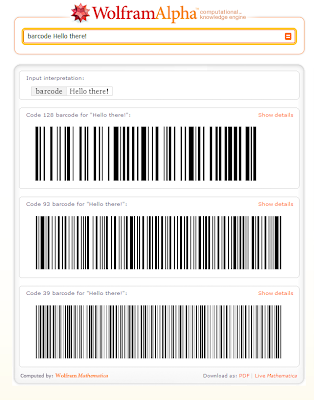 So, here's the first in the series: Creating barcodes. So? Not such a great pastime? You can actually put it to use. You can use it to leave messages for someone. 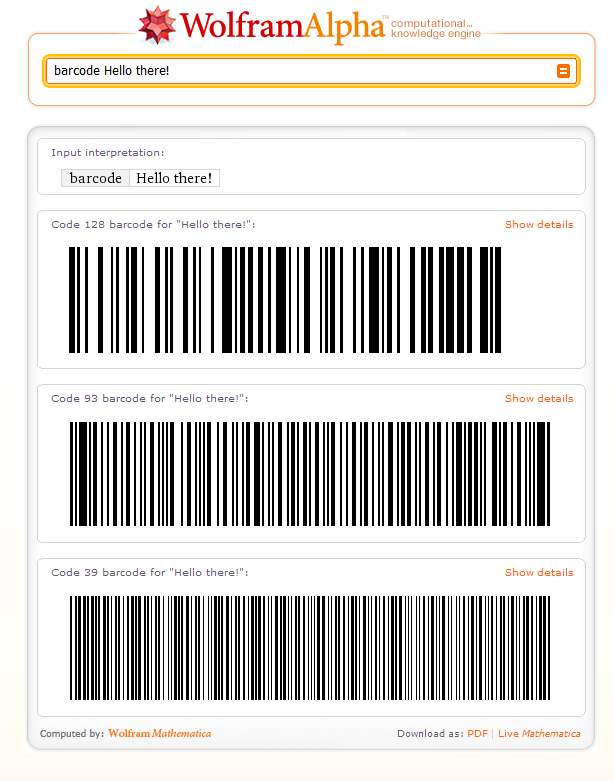 You can snap a screenshot of the barcode from the page, and save it somewhere. The other person can decode it using a barcode scanner in a phone. Android phones have it, and you can download free barcode scanning apps for almost any kind of phone. It needs to have a camera, duh! Even Symbian users aren't left out here. Try the free UpCode and Kaywa Reader if you are stuck on Symbian like me.